Who wants to ride down water rapids when at this exciting slot you can race down cash rapids! Click here to play! Join the gang in this new adventure and spin up the best combinations for some incredible payouts. 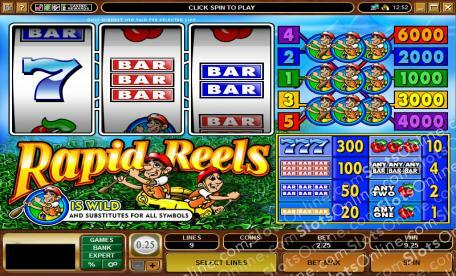 Rapid Reels is a 3-reel slot played across 5 pay lines of pure monetary mayhem, where the more lines you activate means a greater chance of earning winning combinations. The Canoe is Wild and can be substituted for any other symbol on the reels to complete winning combos. The Bars, Cherries, and 7s are all lucrative business, but if you truly want to earn the riches then line up three Wilds on an active pay line. Depending on which line you use, you will be paid out a different amount, anywhere from 1000 coins up to 6000 times your initial bet! Start your adventure today on the Rapid Reels with some cash-filled excitement. The Canoe is Wild and can become every other symbol or logo on the reels. Payouts can reach 6000 coins on the 5th pay line.